From stunning iced floral decorations to elaborate 3D-printed lattices stunning cake ornaments will give your wedding extra wow factor. For many couples, the wedding cake is one of the supreme focal points of the entire wedding. Throughout the celebration, it takes pride of place where all the guests can see it. Later on in the proceedings, when the cake is cut, countless photos will be taken of this precious moment and the cake’s high profile presence throughout the wedding day is one of the many reasons why couples are seeking to personalise them. 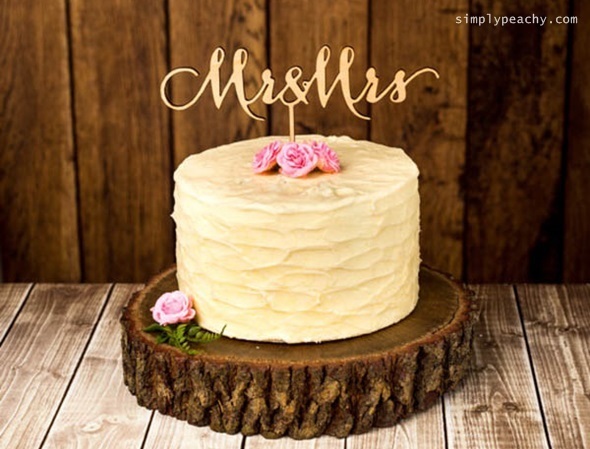 Whether you go for an adorable calligraphy message or an elaborate floral embellishment, cake decorations can truly reflect your tastes and personalities. Below is a selection of favourite ideas. 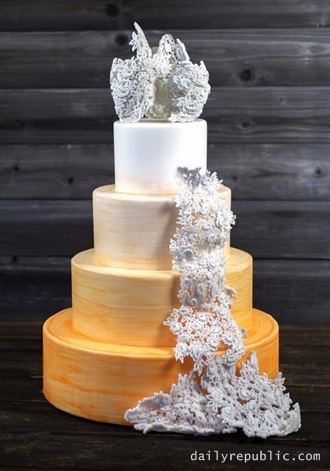 The advancement of 3D printers over the past several years is fabulous news for bride and grooms across the world, as these edgy pieces of tech will allow you to create highly unique decorations for your wedding – including cake toppers. One of the best parts is that 3D printers can actually print in chocolate so it’s even possible to create an edible design to make your cake stand out. Whether you love the idea of printing an elaborate lattice structure to drape down the layers of your cake, or even printing superimposed photographs of the bride and groom onto chocolate figurines, there is plenty of scope for what you can do with these wonderful tools. If you’re getting married in Thailand, then take a look around and let the stunning tropical surroundings inspire you. The Kingdom is home to an abundant variety of vividly-coloured flora and fauna, and if you’re a fan of floral patterns and embellishments then why not translate these natural treasures into stunning iced decorations for your wedding cake? 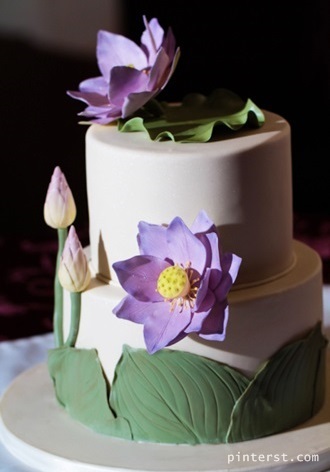 The floating lotus flower is one of the blooms that’s synonymous with all things Thai, and you can even have a professional patissier craft edible lotus blooms to decorate your cake. If you’re getting married in a private villa with its own tropical garden, then a lotus flower will be the perfect complement to help the cake blend seamlessly with its idyllic, lush surroundings. Calligraphy messages are the latest decorative item to take wedding cakes by storm, as a growing number of couples seek to adorn their wedding cakes with meaningful words rather than the traditional mini bride and groom figurines. Traditional messages like “I do” or “Mr & Mrs” should be relatively easy to find if you don’t fancy putting the ornament together yourself. If you want a more personalized message, then perhaps a white chocolate 3D-printed model of your initials will do the trick? Bride and grooms that want to create a rustic vibe could even twist their special message into pliable copper wire for a message that truly pops. If you can’t resist the idea of topping your wedding cake with a more traditional pair of figurines, then why not turn to the animal Kingdom for your inspiration? Plenty of brides and grooms adorn their wedding cakes with cute feathered friends, from elegant magenta flamingos to adorable tiny doves. Simple bird-shaped figurines will be relatively easy to find if you don’t want to make the decorations yourself. 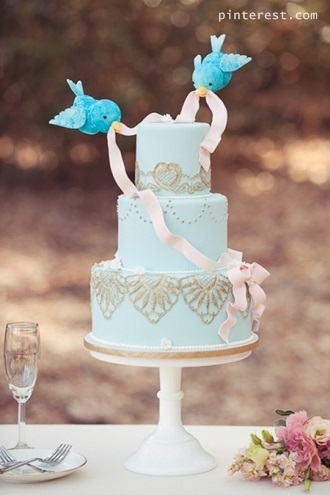 If you do want to create more of a personalized theme, then stunning cake features like gorgeous bluebirds that appear to be draping the ribbon over the cake require a little more expertise on the part of the patisserie. If you’re getting married in Thailand, then your dedicated wedding planner will be able to put you in touch with a master cake maker who will know exactly how to pull off the look that you want. Couples that opt to say their vows in one of Thailand’s stunning coastal destinations can take their cake inspiration from the incredible ocean. The beach is a great place to spark new ideas, and you might choose to decorate your cake with shells from the stretch of sand where you are tying the knot, or even make iced starfish. Islands like Phuket and Koh Samui have a strong nautical culture and tend to attract plenty of brides and grooms that love exploring the ocean. 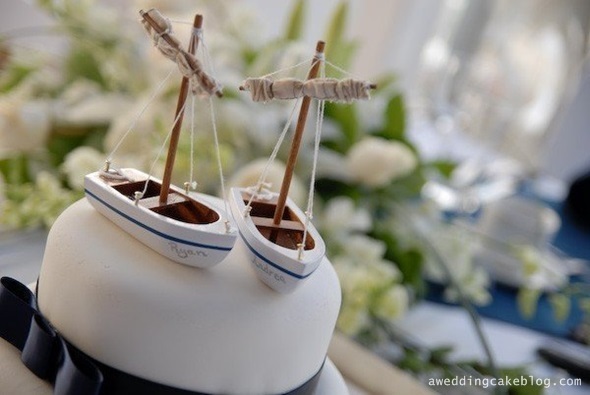 If this is you, then decorating your wedding cake with miniature yachts could be the perfect option to express you and your loved ones passions and interests.